A monument to Mikhail Lomonosov near the main building of the Moscow State University. 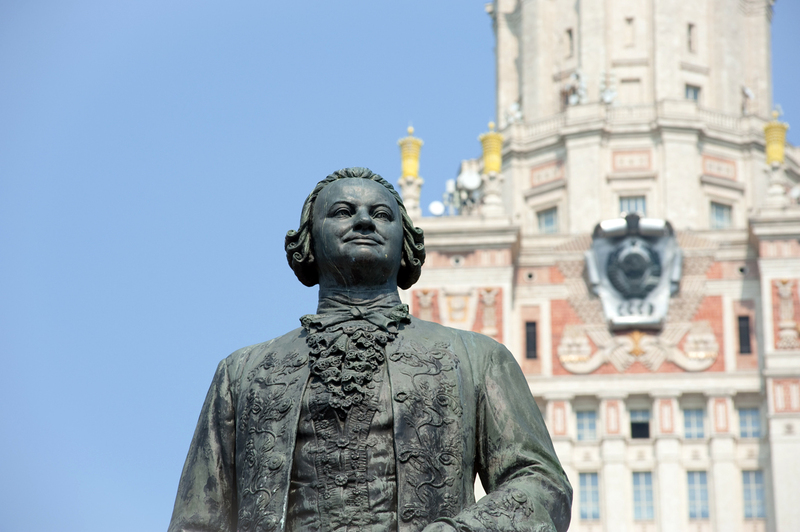 November 19 marks the 305th anniversary of Mikhail Lomonosov's birth. RBTH remembers the peasant from Russia's far north who became one of the most important scientists in world history. Mikhail Lomonosov was born in 1711 in the Arkhangelsk Region in the far north of Russia (615 miles north of Moscow). His father was a wealthy peasant fisherman who, like his ancestors, was involved in maritime commerce. Lomonosov remembered his father as a kind man but "brought up in extreme ignorance," which no one would say about Lomonosov himself. He enjoyed studying even as a child, and mastered several scientific textbooks while still living in his village. Gradually, village life became unbearable for the youth, He quarreled with his stepmother, and rebelled against his father's desire for him to marry. In 1730, he ran off to Moscow with a string of fish carts and entered the Slavic Greek Latin Academy. Peasant children were not admitted to the academy, so Lomonosov introduced himself as a "nobleman's son." The academy's administration easily believed that the young man was an aristocrat, since he knew how to read and write and had a solid understanding of mathematics. Officially, Lomonosov received his noble title in 1745, along with the rank of Chemistry Professor. Lomonosov's education spanned decades. He studied in Moscow, Kiev, St. Petersburg, and in the German towns of Marburg and Freiberg, mastering dozens of subjects, from philosophy to metallurgy. In all his later activity, the scientist maintained this diversity of disciplines, simultaneously pursuing many fields of research. He considered chemistry his main vocation, though. Lomonosov is known as a polymath and is often compared to Leonardo da Vinci, so broad was his sphere of interests and activities. He perfected glass-making technology; developed physics and chemistry theories; worked in the fields of astronomy and geography; wrote grammar textbooks, historical works and odes; translated poetry; and created mosaics. The scientist also founded Moscow University (1755), which today bears his name and is considered one of the best universities in Russia. In 1901, 136 years after Lomonosov's death, geology professor Vasily Dokuchaev, encountering one of the scientist's papers, said in amazement, "A long time ago, Lomonosov described in his research the theory I defended in my PhD dissertation, and he described it in a broader manner." There are other examples of how Lomonosov was ahead of his time. In 1761, he discovered that the planet Venus had an atmosphere, which he observed through a telescope. In 1754, after reviewing documents at the Academy of Sciences, he developed a working model of a proto-helicopter, a flying apparatus that could take off vertically with two propellers. And his corpuscular-kinetic theory of heat in many ways anticipated ideas of atoms that appeared one hundred years later, just like his theory on rotating spherical particles. According to contemporaries, he was not a quiet laboratory scientist. In his article on Lomonosov, Moscow State University docent Grigory Pruttskov wrote that Lomonosov ardently fought against German dominance at the Academy of Sciences while he was working there. Being one of the few Russians employed at the academy at the time, Lomonosov accused his German colleagues of bribery and incompetence. In 1743, Lomonosov allegedly "under the influence of wine vapors," barged into the geography department and reproached his colleagues for not knowing elementary Latin, calling them "trash" and even making "obscene signs with his fingers." Lomonosov was not afraid of showing his temper even during arguments with his influential patron Ivan Shuvalov, one of Elizabeth of Russia's favorites. Once Shuvalov, in the heat of an argument, yelled at the scientist, "I'll have you removed from the Academy!" Lomonosov proudly retorted, "If anything, it is the Academy that will be removed from me." The man from the north had many foes, including in high society. Alexander Sumarokov, one of the most talented poets and playwrights of the time, was constantly at odds with Lomonosov. Their relations were so poor that after Lomonosov's death in 1765 from pneumonia, Sumarokov said that, "The fool has finally calmed down and won't make any more noise." But great Russian poet Alexander Pushkin, who was born after the scientist's death, had a completely different opinion of him. "Lomonosov was a great man. Between Peter I and Catherine II, he was the only advocate of Enlightenment. He established Russia's first university. Or better, he was our first university."